Ok, this is not magic and not exactly steampunk, but it IS VERY VICTORIAN, so in my book it fits. Ripper Street is produced by the BBC and it's my favorite show on TV......well, actually I've never watched it on TV, I saw it on Netflix. Anyway, I've only seen Season 1 of the Show. I had heard that after Season 2, the BBC announced in Dec 2013 that the show was cancelled. And then amazingly, Ripper Street came out to be the #1 Favorite Drama in some Poll taken in the UK. So the next thing you know, Ripper Street Season 3 was announced! I'm getting that news a little late, but still, better late than never. 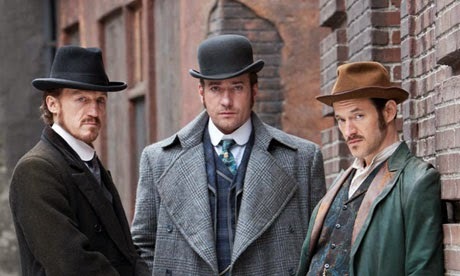 If you have never seen Ripper Street, you simply must check it out. It is set in 1890s England, in the Whitechapel area where the Jack the Ripper Murders were supposed to have taken place. The story takes place AFTER the Ripper Murders, but there is still plenty of crime and drama that takes place on these streets. The show also has a touch of Victorian CSI to it which is highly interesting. The writing and acting on this show is fantastic. The costumes are incredible and the Victorian dialogue that is often used is frankly, educational!!!! And the characters, wow, they are so gritty and human and damaged and full of depth. One of my favorites is Long Susan, played by MyAnna Buring, who is a dead ringer for Kelly Rippa. It's great stuff. Season 1 is available on Netflix. Season 1&2 are available on iTunes, but you'll have to pay for them there. Go to the official site and you can buy season 1 on DVD or BlueRay! If you are venturing down the road to presenting a Steampunk character of any kind, whether for fun or for performance, this show Ripper Street, can be of great help in pointing the way towards costuming and even character traits. If you haven't seen it, please give it a chance, it's a fine show! OH, I'm just watching the first episode of Season 2 and the Elephant Man/John Merrick and his Doctor, Dr. Treeves make a brief cameo! Come on, that is cool! UPDATE: Well this is interesting. I just found out the character of Detective Reid is based on the real Detective Edmund Reid. And the real Reid had a passion for sleight of hand, not in the criminal sense but in the MAGIC sense! So there is a connection to conjuring afterall!